I have one of mine out. It looks like what I thought were threads on the outside of the top is actually just a groove around the smaller radius round top, probably originally intended for some kind of rubber boot or weather seal for the electrical connector. It also looks like the seal inside the cap for the top of the tank neck might be made with a suitable size O-ring. I also see that the "cork" at the bottom that floats up and down does not appear to be making any kind of contact that would close a circuit and send a signal. I wonder how it is supposed to work? I found another thread about this part and it explains about the float--it has some kind of magnet material around its core that changes some kind of resistance inside the core of the sensor and that apparently creates the signal. Now I will wait for Mj's replacement sensor and do some of my own evaluation. I think I am going to find the answer to the question about how Guy got one to work. It's a magnetic reed switch in the central section, which is a fairly simple switch often used in burglar alarm door and window switches, proximity sensors, counters, etc etc. The hole and cylinder in the top of the original cap is .725 in. in diameter, and inside its .300 inch tall, and .200 inch tall outside. 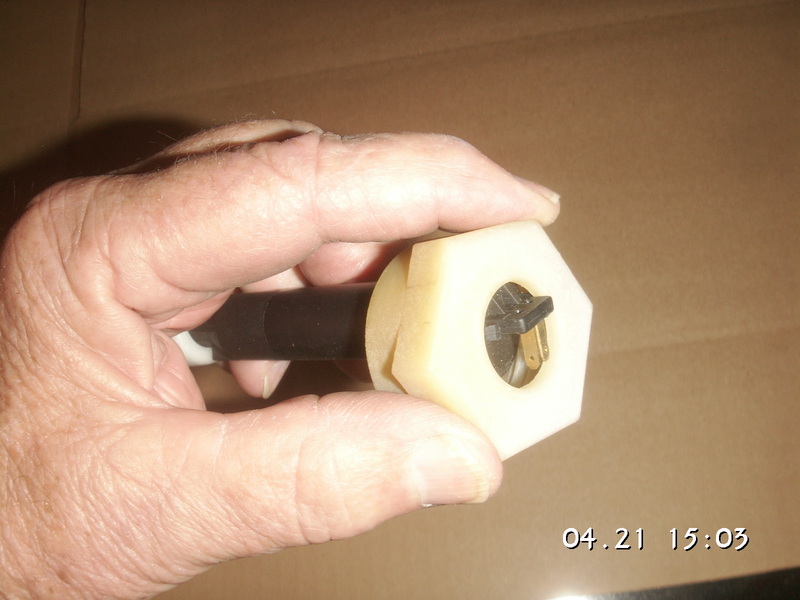 The top of the new sender, the part that might fit inside the top hole and cylinder is .765 inch in diameter, including the width between the outsides of the two barbed prongs on top of it, so it is too big to work in the hole as is. In order for the new sender to fit inside the original cap the cap needs to have its top hole opened up "whittled" perhaps, as previously suggested, to the new sender top diameter of .765 in., and the cylinder-like projection above the cap top completely removed. That will leave the hole in the top of the cap the correct diameter and about .100 inches thick. Then the grip range of the two barbed prongs is .125 inch. So it will be forced through the new size hole, and grip outside the top of the cap, leaving about .025 inch of space for a new rubber seal between the inside top of the sender and the inside top of the cap. Thus there needs to be a new rubber seal made from about .025 to .032 rubber that has the inside hole at .0765 in and the outside large enough to seal around the top of the neck of the collant tank. It can be about 1.300 in od. So the problem is that either the original cap needs to be carefully modified as described or a new cap fabricated. 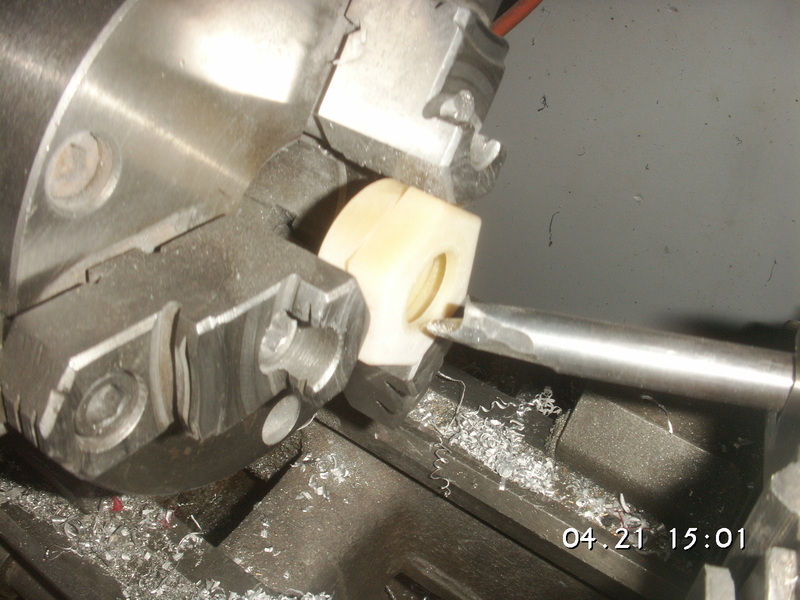 I might look into someone with a CNC lathe and/or mill to see if a cap can be made cheaply enough out of something suitable, and then find the correct rubber compound and thickness to cut the rubber seals. I don't see any kind of adapter washer doing anything for us here. Because of the relative sizes, that is going to be kind of like a wheel spacer with a negative thickness. In the meantime, I'll go out and modify my cap to show what I mean. Last edited by Jerry Feather; 09-04-2016 at 12:33 PM. Sounds good Jerry...Personally I think the whole new cap idea sounds appealing as the originals are very yellowed and ugly at this point in their life cycle. I just replaced the actual tank with a new one thats a nice bright white, it would be a shame to put a yellowed cap on it. 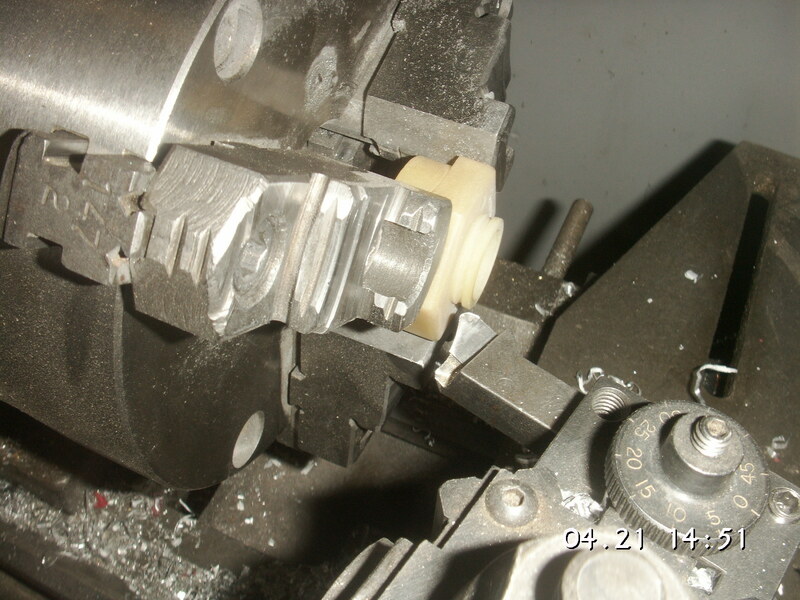 First I turned the top of the center hole/cylinder off. 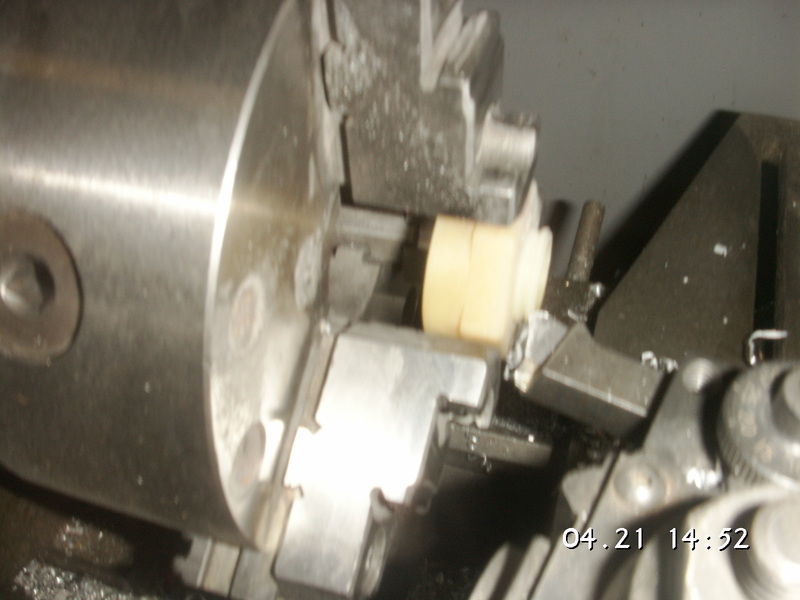 Then I opened up the center hole to slightly over the top diameter of the new sender. Then I tried to set the new sender into the hole so that the locking prongs locked outside the top. Then both of the locking prongs broke off!!! The last picture shows what I was hoping to achieve, but the next to last one show that both tabs or prongs are broken. Well, I guess I didn't think this one through very well. I kind of had it in the back of my mind that the prongs were likely to break, but I guess I had to find out for myself. However, I think this is still the direction to go. 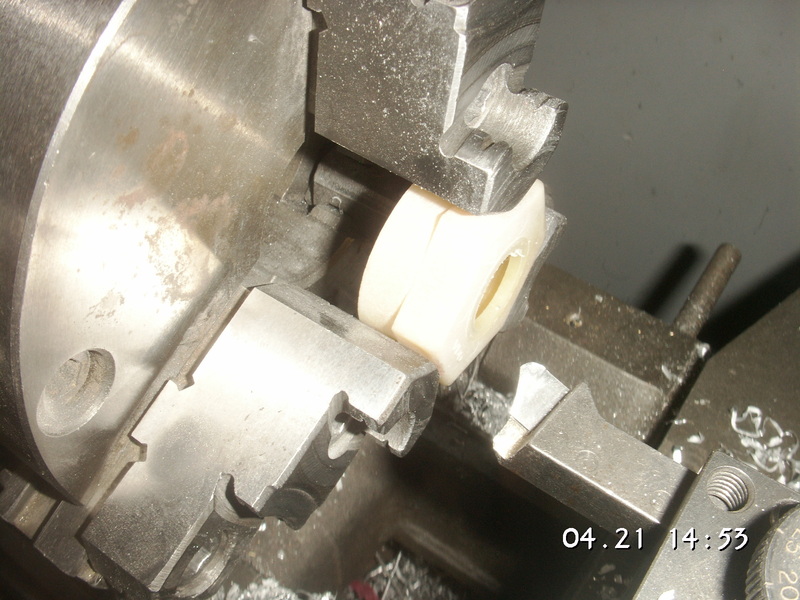 What we will need to do is make or modify the cap so that it has two small slots for the prongs and barbs to slip through then twist the sender about 90 degrees, perhaps up a bit of ramps, so that it tightens itself against whatever we find for the sealing washer. That ought to keep the prongs from breaking and yet keep the sender in place. add some DC111 to the o ring and screw it onto the bottle. and also leave it possible to orient the sender pins, so no cutout for the locking tabs is necessary. Simply open the hole in the cap so the locking tabs will pass through. Stan, you got me with this idea. If I take your suggestion to "simply flip the cap over and insert the sender" literally that seems to me to put the sender sticking up out of the top outside of the cap and measuring nothing but air, even if it would fit into the bottle under the fender. However, given your usual brilliance about these sorts of things, when I figure out what you have in mind I'll bet it will be a winner. On the other hand, my problem in doing these sorts of things is not just how I would get one of these things to fit in one of my cars, but rather how the solution of fitting the replacement sender to the original overflow bottle can be utilized by just about any one of the other 928 guys who might be in need. Even turning the original cap like I have done is not in the cards for just about 99 percent of the needy, even if that would have worked the way I had envisioned. I can fix this one to work fine with some kind of adhesive and something like your o-ring suggestion, but that is not very duplicatable for the rest of the guys. Last edited by Jerry Feather; 09-04-2016 at 12:38 PM. Here's what I am thinking now. And I am sort of back to something like the original washer idea, but in a different way. 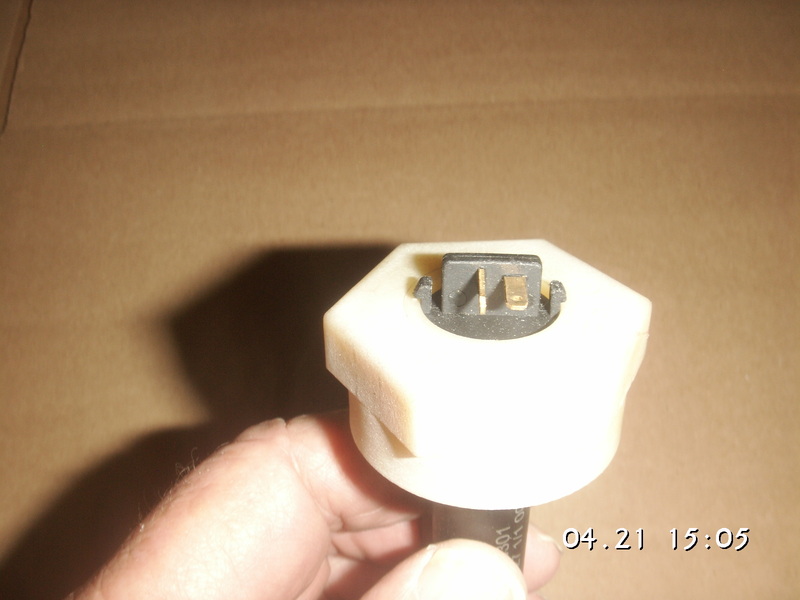 This depends on our ability to have a replacement cap made that is suitable for this conversion, or some program to modify some original caps, if some reasonable source of good used ones might be found. In addition to cutting the center hole flange down and opening up the hole like I have already done I will counter bore the inside of the top of the cap around the hole cutting its thickness to about half, leaving it about .050 or .040 thick in the center and just out far enough for the large diameter of the new sender to fit and maybe a bit more. In that counter bore we will fit a thin flat rubber seal. 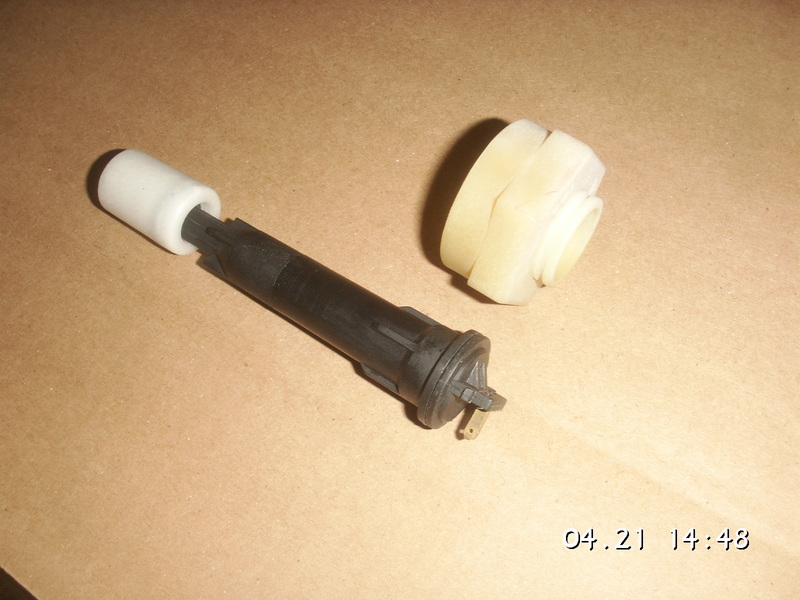 Then we will break the two hooked prongs off of the new sender and then insert it in the hole after the seal. 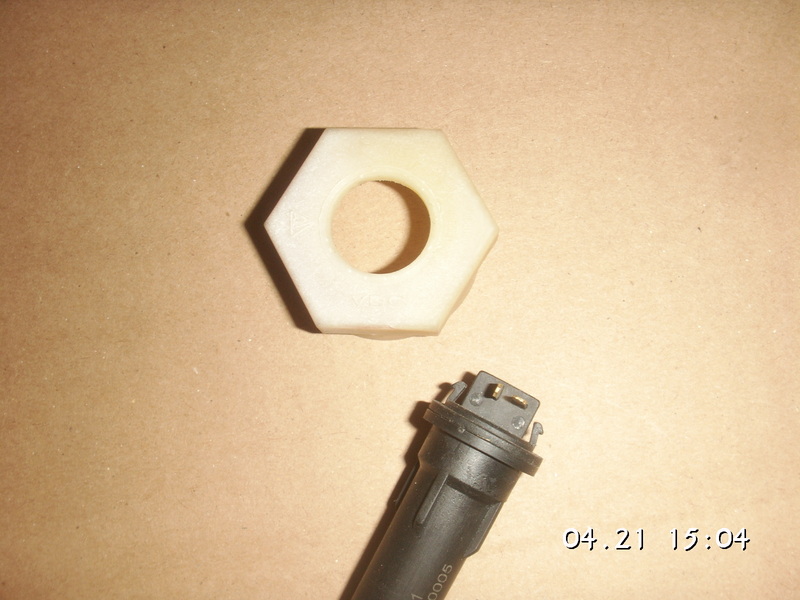 Then we will fabricate a thin plastic washer that is the id of the body of the sender just under its largest diameter, and with the od equal to the id of the cap, then fit another thin rubber washer, same size as the plastic washer, under that and screw it onto the bottle, orienting the contacts correctly just before it is tight. Tightening the cap will close both seals with the plastic washer and sender in between. The small rubber will seal above the sender and the larger below at the top of the bottle. 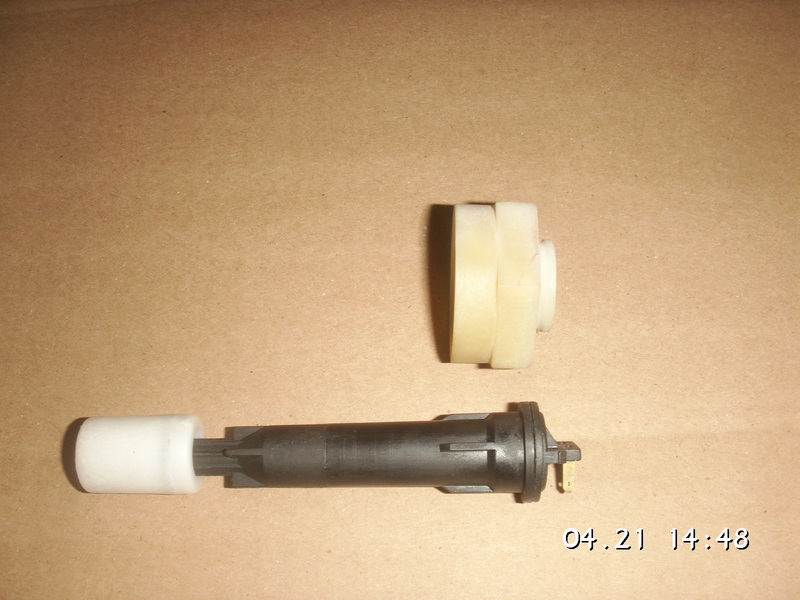 The conversion kit will amount to the new cap, the small rubber washer, the larger rubber washer and the plastic washer for inbetween. Last edited by Jerry Feather; 10-07-2016 at 12:35 PM. get an O ring and install it into the cap after the sender then screw this onto the bottle. the O ring will hold the sender in place and the cap will seal the O ring between the inner edge of the sender and the top of the coolant bottle. Ok, Stan. Now I understand. But, what you are talking is about resealing the original sender. What we are trying to accomplish here is a way to make the supposed "direct replacement" new sender actually work with the original cap and/or bottle. The new one is smaller and nothing about what you suggest will help. On the other hand and on second thought, a very thick o-ring, something like a quarter inch cross section, might very well both hold the new sender in the top of the cap and seal both around it and the top of the bottle. If there is such an o-ring, that might merit some further consideration. But we still need a new cap or enough used ones to modify as I have described. The real solution to this new sender is going to be the cap. And, it appears obvious to me that the cap usually pictured with this new sender will not fit the bottle in the 928. Just guessing that the threads and seal are some standard that the cap for a heavy-duty Nalgene bottle might fit. I'm a country away from the car so can't measure myself, but someone else might if it's handy. Nalgene caps are metric sized, flat-topped, and can be holed with a gasket punch or similar. And they are the same color and consistency as the reservoir. What in the world is a heavy duty Nalgene bottle? I ordered some of these senders to mess further with and to replace Mj's that I broke. I ended up making the order by phone and the guy on the other end, probably in India, told me that they are replacement only for 924 and 944, not 928.